Have you wondered if peanut oil in your cooking is a wise choice? Let me give you some good reason to add them in your diet. 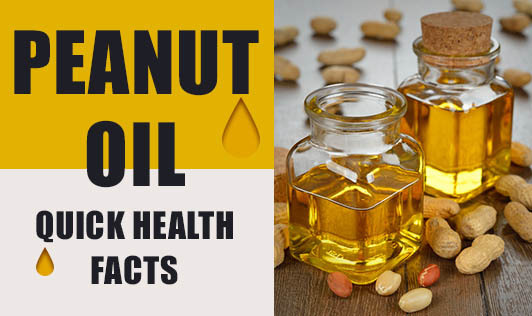 • Peanut oil also known as ground oil, is extensively used in south Asian cooking.. It is preferred over other cooking oils for its high smoke point. • Peanut oil has a very light nutty aroma and is known to enhance the flavor of dishes that are stir fried and deep fried. • They contain heart healthy Monounsaturated fatty acids (MUFA), which lowers your bad cholesterol (LDL) and total cholesterol. • Groundnut oil works wonders on your skin and acne marks. So, if you do have these concerns, give this a try. Note: Those who are allergic to peanuts should also avoid peanut oil. It is advisable to consult with your doctor before adding them into your diet. Peanut oil may not be the best oil among other oils due to its saturated fat content. It is good to reap the benefits of all the oils in moderate quantities. Every oil has health benefits and harmful effects that need to be weighed before using them.